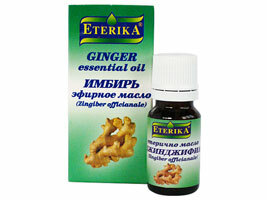 Ingredients: 100% essential oil of ginger obtained by distillation from the roots of Ginger - Zingiber Officinalis. Chemical composition - gingenol, phenols, tingeron, gingizeren and others. Aroma: Exotic camphor, hot, with lemon flavor. Works well with: All citrus oils, bergamot, neroli, rose, sandalwood, ylang ylang, patchouli. Action: Analgesic, antioxidant, antidepressant, antiseptic, exciting, bactericidal, sweating, improve digestion, expectorant, healing, stimulating and soothing, immune, warming-inflammatory, aphrodisiac and others. Application: At a reduced mental activity, colds, runny nose, sore throat, swelling, bruising, sprains, herpes, athlete's foot, air disinfection, apathy, impotence, hangover, stretched muscles, poor appetite, etc..
Contraindications: Do not be used by epileptics, pregnant women, children under 3 years old and people with individual intolerance to the oil. Test your individual tolerance!